I was contacted to write an article for the Charlotte Observer in the home design section, All Photos in this article are my photos and my partners Tonia Mosteller. Do you believe the Christmas and Holiday season are getting closer? know the gift of a Holiday and or Event Decorator. 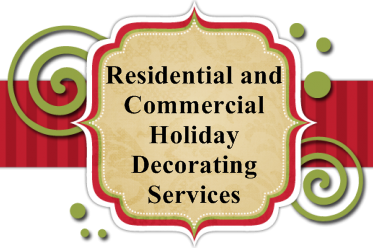 We all know that it takes time and energy to decorate your home or business for the holiday season. Let our decorators help make your home and business look beautiful. Drapes, shutters and shades; there are many ways to dress a window, whether in a bedroom, kitchen, lounge or living room. Here are ten suggestions for you to consider. Roller shades are simple, durable and easy to install. Materials range from vinyl, which is the most economical option, to more expensive fabrics, such as UV filtering and decoratively patterned materials. Balloon shades are available in stationary or functioning styles; both feature voluminous quantities of fabric and are perfect for classically elegant rooms. Stationary balloon shades cover approximately 30 percent of the top of the window and the material hangs in impressive-looking folds. Functioning balloon shades utilize cords to pull the bottom rail upwards. Roman shades are closely related to roller shades in that they lie flat against the window when closed. They feature rectangular sections of fabric which form horizontal folds when opened. Romans are great if you have a special feature to highlight. Drapes are available in an almost infinite range of fabrics and patterns, so can be used to add character and elegance to any room, no matter what the décor or style. In addition to that old faithful, pleated and gathered drapes, there are a number of other styles to choose from. As the name suggests, puddling drapes are cut excessively long and so ‘puddle’ on the floor. They provide the finishing touch to a luxuriously sensual looking bedroom. Hemmed-up drapes are cut to a length that reaches a predetermined point on the window; for example, the window sash. Brush the floor drapes are cut to a length that causes them to just reach the floor. Shutters come in three basic styles: solid, café and plantation. Solid shutters are more traditional in style; they are closed at night and folded open during the day. They are particularly suited to Victorian style houses and cottages. Café style shutters cover only the bottom half of the window; however, a tier on tier variation is also available, which is effectively two sets of café style shutters fixed one on top of the other to cover the entire window. The most popular of the three styles are plantation shutters; they feature louvers which allow variable levels of light in, depending on how far they are rotated. This type of shutter is extremely versatile and can be used to make a feature of windows in almost any style of property. Shutters are particularly useful in that they can be manufactured to fit windows of almost any shape. Stained glass does not have to be traditional in style (for example, the windows we associate with churches and cathedrals). On the contrary, it can be stunningly contemporary with abstract patterns, almost clear glass with just a few subtly colored sections to grab the attention, or completely opaque. Have a craftsman design and assemble a unique window just for you. Window netting is an economical and attractive solution when a little extra privacy is required without completely blocking out the light, and there are many choices available. You could opt for traditional lace or lightweight voile material and finishes that range from plain to heavily patterned. Interior-savvy homeowners often avoid buying items from popular generic home stores because they don’t want a house that looks like everyone else’s. Whilst this is a valid concern, for those on a budget, these stores really do provide some fantastic and affordable pieces. The key to incorporating these into your home with style is to get creative and commit to some crafty personalization. Buying a plain white shower curtain will cost less than $15, for example, but you can make it look considerably more expensive, and tie it into your existing bathroom décor by trimming it with a deep fabric hem in a gorgeous on-trend fabric. Similarly, you can buy scatter cushions for your bed or sofa in plain bold colored fabrics and then embellish them with sequins, lace or even add your initials in fun felt or velour to really give your accessories that personal touch. Once you start personalization the possibilities are endless: add a ribbon border along the bottom of your lampshades and add a trim and homemade tiebacks to your curtains. Sometimes we become so used to the way our homes look that we don’t consider the impact a different furniture formation could have on the space. Take a step back and look objectively at all of the furniture you currently have in your home. Is it working as hard as it could be? Do you have interesting pieces in your spare room, where nobody sees them, that would be used and seen more elsewhere? Reconfiguring your rooms can make them look completely different without having to spend a penny. You could also repurpose and paint worn out furniture and other décor to make it look and feel as good as new. You will be amazed at the impact a fresh coat of paint can have on a room, particularly if you choose a bold and attention grabbing color. If you opt for light or pastel shades then paint the whole room and you’ll be amazed by how much lighter and brighter it appears. If you prefer vibrant primary colors then painting the whole room may be overpowering. Instead, opt to paint just one feature wall: for the best impact choose the wall that either your sofa or another key focal point is placed upon so that you can ensure the color will draw the eye. For the color shy you can achieve a similar affect using new bold colored accessories in the room instead. Just ensure that the color you choose is vibrant and contrasts with your existing décor in a complimentary way. No matter what your budgetary constraints, there are some things that you simply shouldn’t scrimp on when it comes to updating your property. Don’t try to complete difficult technical jobs, such as wiring or anything else electrical, yourself: It is often cheaper and less risky to your health to simply bring a fully qualified expert in to complete the job. You should also never scrimp on your home and contents insurance when your finances are tight: if you are burgled or the victim of a natural disaster then this is the time of your life then you would be least able to afford to replace all of your possessions. Finally, don’t be afraid to buy or accept second hand furniture from friends and family. The quality of your furniture is important and, ultimately, you will want to have one piece of good quality furniture in every room of your home. By accepting second hand pieces you will be in a better position to save and buy new furniture the next time you come to decorate your home. Not everyone has the time, money or patience to do a complete overhaul on their whole house just to follow the fashions of interior design every year, but with a few straightforward additions/changes it can be simple for anyone to create a new, fresh feel to any living space. Painterly pastels are vital this year, and with the injection of soft blush pinks, hints of copper and pale petrol blues it’s easy to completely transform a space. Changing a few feature points is a great way to introduce 2014 trends. Invest in a high-quality bold-printed pastel rug to act as a focal point to begin the transformation. Warm up the colors of this trend which can sometimes appear quite cold, with natural oak and pine furniture. Incorporate soft shades in water-color art to act as a focal point, and remain minimal with accessories to create a chic, stylish environment for your living area. Another big style this year to get inspiration from is Hollywood Glamour. Any form of glamour in fact this year is set to remain massive, and with such a quintessential theme this is a trend that will just last and last. Grey, mustard yellow and turquoise colors are vital when following this style. Timeless furniture is also essential for this trend, therefore it’s a great idea to concentrate on what type of sofa you need to suit this and complement your chosen color theme. It’s an idea to purchase your perfect furniture pieces first and build out from this. In order to re-work this style year after year, consider a grey, simple box sofa and add themed colors of Hollywood Glamour, to create a dateless living room space. Adding either authentic or mock ethnic fabrics, upholstery and prints to your living space will definitely add a fresh vibe and will complement existing furniture in classic materials and fabrics, such as quality leather. This is a great easy but effective way to completely transform an area without having to redecorate or invest in any expensive alterations. If you can get your hands on authentic then all the better as these will not only provide wonderful conversation pieces, but also little tokens of memorable times from travelling abroad. Go for quite a simple decoration that will be able to stand up to these prints, which could get lost in an overly fussy room. So even though beige colors are not as hot this season, this will act as a great base for incorporating bold prints to match this theme. If vintage is your thing, Victorian style is set to be massive this year. Be that parquet-style laminate flooring, dark-stained flooring or anything else of this dramatic nature. There are far less imposing ways to still revamp a room into a Victorian dream, though. Eccentric Victorian trinkets and ornaments are a great place to start, but consider also branching out into a staple couch and armchairs. Don’t be wary of introducing Victorian imagery to really enhance the theme. Flea markets can be a source that’s great to pick up authentic pieces; watch out for globes, quirky printing blocks and old-fashioned telephones. According to Independent Mail the best time to hit flea markets is in winter and early spring. This trend really is one to have fun with and the possibilities are quite endless. Another great focus for this style is to bring through literature inspired artwork and collectible copies of classic novels. An interesting new trend that has begun to take form already this year, and is set to come into its own over the summer is to merge the outdoors with the in. This is going to mean getting creative with flower displays. The flower vase on the mantel piece simple isn’t going to cut it this year. It’s really worth visiting a local flower show or event to get an idea of what you think you can realistically accommodate into your living space. Conservatories are a really good place to first introduce this theme, but why not be adventurous and see where you can take it in the rest of your house, too? So this year why not try your hand at reinventing your living space to create a whole new feel with these trended inspirations. It really is that simple. Buyers are quick to judge a home by what they see on the outside. Are your sellers ready for the scrutiny? While most real estate professionals advise their clients to tend to the yard work, trim the trees, and put out a new welcome mat, they may miss other opportunities to help sellers improve a home’s curb appeal. Staging and real estate professionals offer some compelling ideas for sprucing up exteriors. A front door can be a home’s focal point—but you don’t want that to be because of its peeling paint or dinged hardware. Replacing an entryway door with a new steel door (which costs about $1,200) actually offers among the biggest bang for the buck at resale (an average of 73 percent of the cost may be recouped, according to Remodeling magazine’s 2011–2012 Cost vs. Value Report, which analyzed 35 remodeling projects’ payback potential). Wash them—inside and out—and remove the screens for added sparkle. Then, try dressing up the windows with flower boxes, suggests Peggy Johnson, owner of Redesign + More, a Charlotte, N.C., interior design and staging firm. Also, consider a new color for shutters. The trend is a shift away from high-contrast green, red, or black to more monochromatic palettes that blend with the rest of the house, according to the Paint Quality Institute. Depending on its orientation to the house, a garage can make a huge impact. Does the door need paint or repairs? Should it be replaced? While sellers might not be willing to spend on a stylish new cedar wood door, they can find more budget-friendly options in metal or fiberglass. A new steel garage door can cost about $1,500, but sellers, in average, recoup nearly 72 percent of that investment at resale, according to the Cost vs. Value Report. Don’t overlook this key selling point. “It’s an iconic symbol of American living,” Vail says. “‘Sell’ your front porch as additional square footage by staging it with as much care as you would other rooms. Invite buyers to ‘sit a spell’ with a pair of rocking chairs, Adirondacks, a porch swing, or even an outdoor living suite.” And don’t forget to “add a coffee and a side table for writing up contracts,” Vail notes. Is the driveway covered with cracks and oil stains? If sellers can’t afford a complete resurfacing (which may cost about $2,000 for concrete driveways), encourage them to look into patching up cracks using premixed concrete materials, Johnson says. Driveway cracks a quarter-inch or smaller may be able to be filled with asphalt or concrete that comes in caulk-like tubes. A patching compound for asphalt can be used for larger cracks. Some experts recommend kitty litter for removing oil stains, though hardware stores offer designated products, too. When you think of the four seasons, certain images immediately come to mind. For summer, it’s barbecue grills, swimming pools and lawnmowers. For fall, it’s pumpkins, turkeys and footballs. Winter is hot chocolate, snowmen and stockings. And spring? How about buckets, brushes and a mop? While the season is a sign of new birth, it's also when most people take the time to clean up. For centuries, spring has been the season for cleaning. In Chinese culture, they have traditionally swept their floors and cleaned out their houses to purge any bad luck and prepare for the coming of a new year. According to Jewish lore, Passover is a time to clear out the home of all leavened products. This led to a full spring cleaning of the home. Meanwhile, in America, the idea of spring cleaning has become a tradition for very practical reasons. The cold and darkness that trapped you in your house all winter fade away and are replaced by longer days and warmer weather. If your cleaning is mostly about changing the look of your place, it does not have to be expensive. Something as simple as moving artwork to different walls can give your home a different look. The same goes for the bedroom, where Turner recommends just buying new sheets or a duvet to alter the look of the space. The dining room can get a spring facelift, too. It’s getting brighter outside, so try the same inside by doing what Johnson likes to do: put a bowl filled with colorful, seasonal fruits like oranges and lemons apples on your dining room table. While it may be a little more time consuming and expensive, spring is also the best time of year to install ceiling fans. As the weather warms up, you know you will leave the windows open to catch a nice breeze. That makes spring the time to free the screens of dust and grime. Lipford creates what he calls “a screen bath" for the job. He fills a watertight object like a kiddie pool with soap and water, then places the screens in the mix. They only need to soak for several minutes before they're ready to go back in the window. Spring also offers the first chance in months to get out and spruce up your yard. Lipford suggests starting with improving the curb appeal of your home by working on the first thing you see when you come home and the last thing you see when you leave -- your mailbox. Spring is traditionally the time for planting, but you also need to get the soil healthy enough for flowers like the summer hydrangeas. According to Lipford, pH testing kits are cheap and available at most home and garden stores. They’ll let you determine if your yard has an acceptable level of lime to allow plants to thrive. They must be used early in spring so you have plenty of time to improve the situation if your soil isn’t healthy. The earlier you can start on spring cleaning projects, the longer you’ll have to enjoy your handiwork. Getting your home ready for the holidays can really put you in the spirit of the season, but not if those displays are putting a crimp in your budget. This year, why not stay debt-free when decorating for the holidays? Whether you're hosting a house full of relatives, inviting friends over for some bubbly or just enjoying a quiet night by a crackling fire, our tips for festive decor can add to your enjoyment of the holidays without leaving a hole in your pocketbook. "Use natural products," says Peggy Johnson, owner of Redesign + More. "Right here in our backyard, we take pine cones and get creative." One idea: Johnson likes to combine pine and holly boughs with pine cones and artificial garland, then spray with aerosol "snow" to give her creation a unified look. When it's finished, no one will know that the display gracing your table or mantel didn't cost big bucks. Even if you're a city slicker, you can hang on to the boughs you lop off your tree to fit it into the stand, then use them to decorate another part of your house, like the mantel. "Instead of buying centerpieces at Pottery Barn or Frontgate, I create my own," says Johnson. Don't be afraid to comb through your attic or even your china cabinet to unearth unused clear glass containers. These can be filled with holly berries, inexpensive round plastic ornaments or pine cones to create unique, low-cost centerpieces. When it comes to your yard, you don't need an inflatable Santa or an army of animatronic reindeer to make it look festive. In fact, you don't need to spend very much at all, says Johnson. White, indoor-outdoor lights on shrubs flanking the doorway or front walk are classic. If you want those bushes to have some pop in the daytime, too, pick up an inexpensive roll of ribbon from a craft store and tie a scattering of small bows around the branches, she suggests. For an alternate look, pick up a container of super-cheap plastic balls and decorate shrubbery with those. Redesign + More Event Decorating Services promoting special summer time rates.We can help you put together you next Holiday Event, Special Event, Private Corporate Event, Charity Fundraiser Event as well as decorating for birthday parties, anniversaries, weddings, graduations, retirement parties and much more. . Let us handle all the details and decorating so you can enjoy life without the stress! HGTV Reality Show Casting In Charlotte NC- For First Time Home Sellers! Peggy Johnson with Redesign + More was contacted by Marybeth Brush with High Noon Entertainment for HGTV and I would like to share this great information about My First Sale the popular HGTV show. Read below for more details. Charlotte NC - HGTV Reality Show Casting For First Time Home Sellers! Then HGTV is looking for you! MY FIRST SALE, the popular primetime HGTV show, is looking for first-time home sellers with a unique story (and their real estate agents!) in the Charlotte, NC area. We are looking for fun, high-energy people with an amazing story who are just starting the process of selling their first place! Our cameras will be there to capture all the trials and tribulations, stress and success of prepping for sale, pricing, negotiating, and ultimately selling a home for the first time. Taping will begin in Fall 2010 and will continue through Spring 2011. Ideal candidates will be motivated, financially candid people who want to share the experience and the purchase details with HGTV and their audience. Singles, couples and families are all invited to apply! If selected to appear on an episode of My First Sale, home sellers will receive a DVD copy of the episode to enjoy for years to come. Real estate agents will also receive a DVD of the episode. If this sounds like fun, first-time sellers should apply now for immediate consideration!